Kenji Hayashi is rejuvenating depopulated rural areas in Japan by creating pathways for emerging urban professionals to build their careers—and lives—in rural municipalities. Kenji launched FoundingBase to catalyze social, economic, and mindset changes that enable the sustainable development of struggling rural communities. He is creating two mindset shifts: the first is upending the traditional idea that rural areas are not for urban elites—but rather they can be places to grow and thrive. The second shift encourages rural municipalities to look for new sources of innovation and inspiration to conquer current depopulation challenges. For Kenji, the key to the future of Japan’s rural areas requires attracting new people—not just tourists—and long-term strategies that bring in business. By recruiting young people from top universities and proving that smaller towns may be more open to new ideas than cities, he ensures multi-faceted growth. FoundingBase also creates new possibilities for local citizens, empowering them to embrace change and play a pivotal role in reshaping their community. FoundingBase is currently working across seven different municipalities across Japan with plans to expand to more cities. 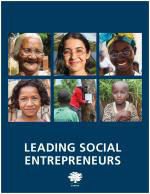 Kenji' s story appears in the 2018 edition of "Leading Social Entrepreneurs" which features a selection of just a few of the Ashoka Fellows recently brought into the largest global network of social entrepreneurs. The LSE presents some of the newest innovations by leading social entrepreneurs whose ideas are changing the way things are done all over the world.